evolution of how we think about design: from human factors approaches to improving interfaces to user-centered system design and further on to reflecting on the impact of our design on people and society as well as stimulating reflection on their part: “…as technology designers it can be both exhilarating and unnerving to see how the design decisions we make, consciously or unconsciously, shape the micro-texture of people’s everyday experiences.” (from Reflective Design). Remember the 3 “camps” we talked about: UCD-ACD-GDD-UX vs. critical/reflective vs. human factors and their distinguishing features. I also showed you some fun infographics about the various skills and disciplines involved in UX work. Here is my collection on Pinterest. Look at them a bit closer, and think about where you are and where you would want to be. I invite you to think about which of the values and design philosophies we discussed appeals to you and aligns with your personal values and ethics. What are the most important 1-3 ideas you took away from class? We clarified the basics of why and when to conduct usability testing. Then I explained more detailed usability metrics and procedures, based on the the book Measuring the User Experience. I also introduced to you Website Experience Analysis. Slides are below. I’d like to emphasize that it is very important to review class readings and notes, and to do a bit more secondary research as you work on your projects. You do need to read more about usability testing (metrics, procedures) before you conduct your own research. Otherwise, we will again see basic mistakes that could have been very easily avoided. We then practiced a very quick and dirty usability test and looked at BlueJeans for next week’s class. Next time we meet, we will look at what to do with the different data we collect from a usability test – how to analyze and present it. The slides used in class are below. Here is the article about creating faceted classifications that I mentioned in class. I highly recommend the chapter on card sorting from the book Measuring the User Experience. Please see me if you would like to read it. It is a bit longer than the reading I assigned for class, but goes in much more depth. Please ask questions related to this topic in the comments below. Core interaction design concepts: controls and menus. Remember the 4 types of controls: Imperative, Selection, Entry and Display. Remember that they’re implemented differently on various platforms. Although the grammar is similar, the actual languages are different. See, for example, the guidelines for iOS, Android and Windows 8. Slides used in class are below. Remember the streamlined cognitive walkthrough as one rapid method for early in-house evaluation. If you have further questions that were not answered in class, please ask them in the comments below. Please look at the slides below. They take class conversation one step further, and show how you present the ideas you create using sketches, storyboards, wireframes, mockups and prototypes. prototypes – are interactive. They can be made out of sketches, wireframes or mockups. Or, they can be rough live codes of the product you envision. They vary in fidelity. Read this article about wireframes and their importance, then look at the slide decks below that illustrate these definitions and differences. There are many tools out there for wireframing and prototyping. In this class we will use Balsamiq and Axure, but I encourage you to try others as well – see a review of several tools from Cooper.com (yes, THAT Cooper). You might also want to bookmark this collection of wireframing resources I created a while back. When you’re done, head back to Canvas and read the scholarly articles about how to evaluate the products of conceptual design. Personas – what are they, why would you want to use them instead of a report with graphs and charts? What are the do’s and don’ts about affinity diagramming and personas that you learned from readings and class experience? Please add your takeaways to the comments below. We began class with an overview of the user-centered review process. We identified the specific activities taken in 2 of the articles we read and mapped them onto the steps of the UCD process. Appropriate research goals: to understand users, their goals, needs, mental models, and current experiences. Inappropriate research goals: to figure out what users want, or to treat them as designers. 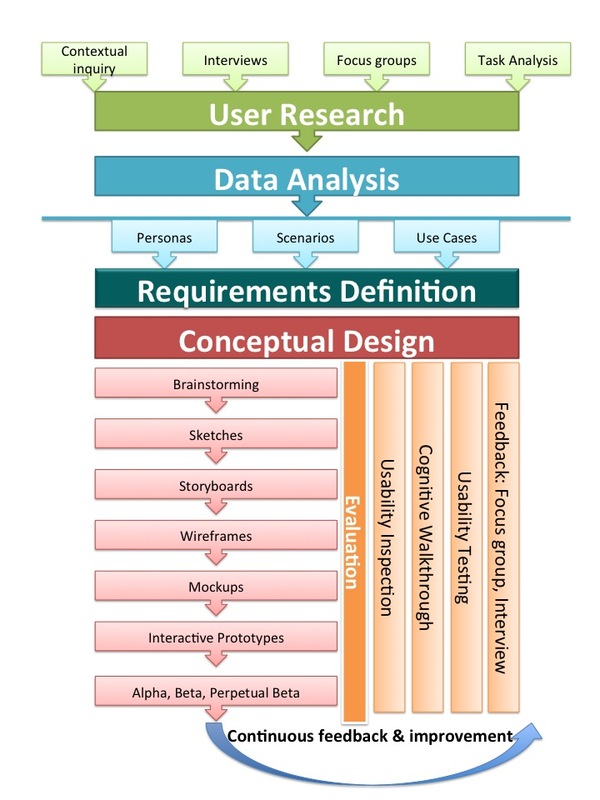 Unless you’re doing participatory design, this research goal is not very useful. Remember: users are not designers. Observation is queen. Whenever possible, conduct some sort of observation – ideally coupled with interviewing, as in contextual inquiry. We usually aim for in-depth understanding – qualitative data from a limited number of people rather that shallow information from large numbers of people. One method that you can use to gain an in-depth understanding of users is task analysis. We did not discuss it in detail in class, but please do read about it and ask questions in the comments below. Finally, remember to let me know if these class notes are useful to you, and to indicate in some way, by rating, commenting, etc. that you have read this post.